The current release is the 2014 Retour Pinot Noir Willamette Valley. This wine is 100% pure Pinot Noir. A blend from five vineyards with an average age of vines that are 40-45 years old. The appellation is Willamette Valley with a topography of southeast facing slopes and an elevation range of 450-800 ft. The diverse soil types are Jory, Nekia, Willakenzie and Laurelwood. 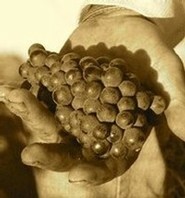 The grapes were harvested by hand and sorted in the vineyard, and again at the winery, to ensure pristine quality. Harvest dates ranged from mid to late October 2014. The barrel regime is 18 months, 100% French oak and 45% new. Winemaking techniques included native yeasts, natural malolactic fermentation, small open-top fermenters, hand punchdowns and it was bottled unfiltered and unfined. Very limited production. Retour becomes more expressive with aeration, unveiling its charming personality and is persistent towards its evolution towards greater complexity. Open a bottle and watch the progression over a five-day period (if you have the patience!) to really capture its true craftsmanship. An initial perfume of lavender, fragrant violets and just-plucked cherries mingle with complexities of roasted hazelnuts, black pepper and minerality. Aeration reveals glorious aromas of cassis, exotic spices, anise and blackberry blossoms. FORBES: "One of the Coolest Wine Labels..."
For more than a decade, Lindsay Woodard has designed packaging for wineries around the globe. Her avant-garde designs have helped launched brands that achieved heightened perception within the market, chatter among the trade, consumers and media, while gaining instant credibility upon their Inaugural Release. Her strong creativity, high level of professionalism and depth of knowledge in the wine industry allows her to design brands that have distinction, purpose and integrity. 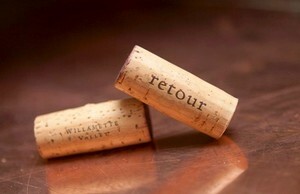 Upon creating a design for Retour, Woodard wanted a label that would showcase the identity, intellectual quality, weight, structure, complexity and texture of the wine. Determined to step outside of the expected norm with packaging design, she created a rare object of art and an aesthetic that has become a powerful icon. The sculptured metal label wraps around the bottle symbolizing the distinct personality and focus of the wine. It is a reflection of the meticulous work that goes into growing the grapes and making the wine. The raw material captures the purity and transcends the essence and fabric of Retour. Woodard, along with her mother, Leigh, applies each individual label by hand. Bouchon "Bou", a Bichon Frise, oversees the quality control of each label application. FORBES listed Retour as a 2015 winner for "One of the Coolest Wine Labels". Writer Katie Kelly Bell and the team of Real Picture Research conducted the test and research with 81 bottles from around the world. It is an honor to receive such esteemed recognition. "Peeling Back The Layers On One Very Big Bottle"
Acquire Direct From the Winery! We have been incredibly humbled with the success of achieving superior placements with restaurants throughout the nation. From Michael Mina and Gary Danko in San Francisco, to Jean-Georges, Alain Ducasse, The Lion and Waverly Inn in New York, to Adour and The Oval Room in Washington DC, to Tony's, Mark's, Brennan's and The River Oaks Country Club in Houston, we could not have hoped for greater representation on such esteemed wine lists. While Retour can be found in select restaurants throughout the country, our Pinot Noir is available direct from the winery. 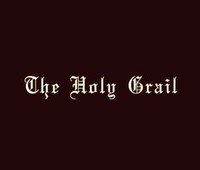 Due to the extremely limited production of Manifest Destiny, the wine is only available to members of the Mailing List. Retour Direct Members also have first access to new releases, large formats and library wines. Click here to Join the Mailing List. Private tastings at the winery are by appointment only. Please contact us to schedule your visit. 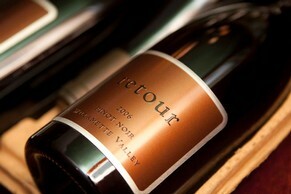 Retour is a wine that is crafted to age gracefully in the cellar for years to come. We highly recommend storing the wine at 55 degrees F. Upon pulling the cork, you can expect the wine to have nervous restraint and exciting tension. With aeration, Retour becomes more expressive, unveiling its charming personality and is persistent in its evolution towards greater complexity. We recommend decanting for at least one hour prior to consuming. Often times, collectors will share that they are impressed with the evolution of a bottle of Retour over a five-day period. Should you have the patience, you will be rewarded by capturing its true craftsmanship. Check back here often, as we will update Optimal Drinking Times. 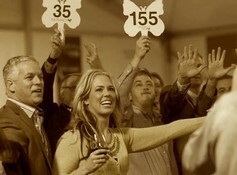 Note the older vintages are SOLD OUT, this is solely to help guide you on the drinkability of each vintage. Depending upon your personal preference as to when you should drink... it's really all up to you. If you like wines with age (as we do!) then by all means, we encourage you to continue to cellar the wine as these vintages are not going to mature anytime soon. Vintage 2006: Inaugural Release - if you still have this gem, keep it lying down. Still very fresh. Vintage 2007: Drinking beautifully, but must have proper time for aeration to unveil its true finesse. Vintage 2008: Intense, focused and great concentration. This wine needs more time in the bottle. Vintage 2009: Pitch perfect acidity really makes this wine sing. The structure will allow it to age for several years to come, but you can certainly enjoy its nuances right now. Vintage 2010: Highly structured. Persistent towards its evolution towards greater complexity. Strongly recommend cellaring. Vintage 2011: Open a bottle and watch the progression over a five-day period (if you have the patience!) to really capture its true craftsmanship. Vintage 2012: Gorgeous, seductive, elegant and highly intoxicating.